Several weeks back, after dropping Travis off at school, Jordan and I had an epic food afternoon. First we stopped at this amazing bakery called SweetItaly (their website must be brand new, but the address and phone number are at the bottom) and had a cannoli and an eclair. They were both delicious and worth the drive to Point Loma. Not only were the desserts delicious, but the atmosphere was great – we felt like we had been transported to Italy. Needless to say, we plan to visit that bakery again. So onto the main course. We headed to Liberty Station to see if we could find some dinner. I know weird – we ate dessert first. Ok, really it’s not that weird for us! We found this cute place called The Fig Tree Cafe. It was adorable. We both loved the interesting decor. We were there a bit early so we had the inside to ourselves. Several people were outside enjoying the patio. 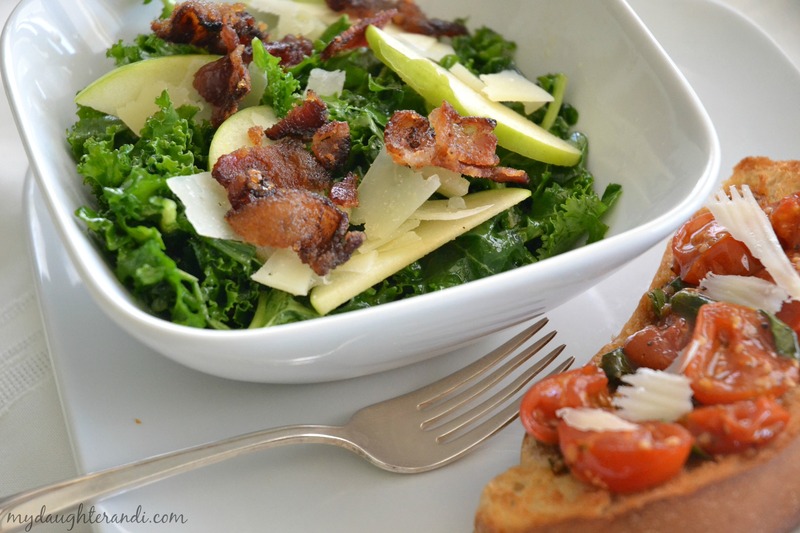 We decided to split the kale salad and split the bruschetta- it was the perfect amount of food. 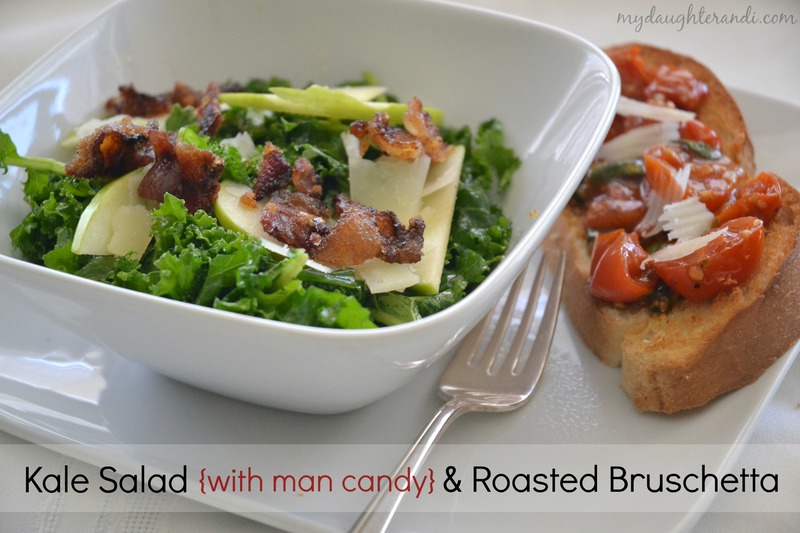 The kale salad had something called man candy on it. It is bacon that is cooked with brown sugar and cayenne pepper. I knew we had to try this at home (if nothing else because of the name. I mean, come on- how could you not want to know more?? ;)) It also had a light vinaigrette dressing on it that was just delicious and perfect with the other flavors. The roasted tomatoes on the bruschetta were so sweet and flavorful – it was just an amazing meal. Normally I don’t dream of salads and roasted tomatoes, but have been dreaming of this meal and was excited to recreate it at home. So below is my version of that incredible meal. I hope you enjoy it as much as we did. This recipe was enough for two of us for lunch. We gobbled up the leftover man candy after we finished our salads. 1/8 -1/4 cup Manchego cheese, thinly sliced. Manchego is a slightly sharp sheep’s milk cheese. If you can’t find it, I would substitute fresh Parmesan, sliced. Citrus vinaigrette dressing, recipe below. Wash and tear kale and put into a medium sized bowl. Start cooking bacon. Put slices into skillet and cook over medium heat until one side is completely cooked. Flip bacon over and top with brown sugar, cayenne pepper combo. I just mixed 1/4 cup brown sugar with 1/4 to 1/2 tsp. cayenne pepper. Using a teaspoon I carefully coated the top/cooked side of the bacon. I continued to cook the bacon, not turning it again. Remove from pan and place on a plate until you’re ready to use it. While bacon is cooking, slice apple and cheese. Prepare citrus vinaigrette dressing. Once all the elements are ready, toss kale with dressing and serve onto two plates or in two bowls. Top with chopped man candy, sliced apples, sliced cheese. Enjoy! Mix all ingredients together in a jar and shake to mix. So the second part of our delicious meal was the roasted tomato bruschetta. 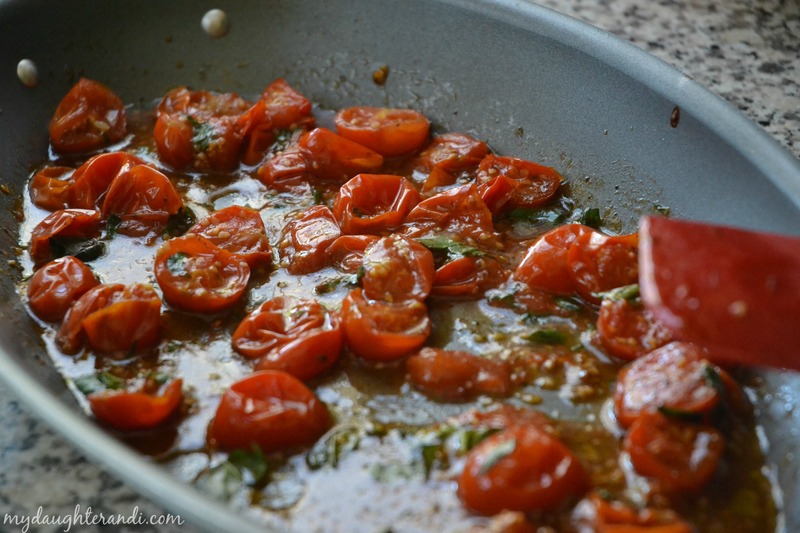 When you roast tomatoes they get so sweet and wonderful, but I don’t like to overcook them. They tend to get sort of mushy. With the toasted french bread this was a wonderful addition to our salad lunch. Wash and slice tomatoes. Put into oven safe pan. Add olive oil, garlic and salt and mix well. Cook at 450* for about 10 to 15 minutes until tomatoes soften and sort of pop. Stir and check frequently. Remove from oven and add about 1 -2 T fresh chopped basil and about 1 T balsamic vinegar. Give it one more quick stir. Serve immediately over freshly toasted, warm fresh bread. To prepare the French bread, slice 4 thick hunks of french bread from a loaf. I just picked mine up at Walmart, nothing fancy. Mist with a bit of olive oil and put in oven or toaster over until just slightly crisp. You don’t want this to be hard and crunchy- it will be too difficult to eat. Just watch carefully as it is toasting. Top with the fresh tomato bruschetta mixture along with additional fresh basil if desired and a bit of fresh Parmesan shavings. This was wonderful with our salad, but would have been a great appetizer on its own.